November 24, 2015 Anna P.
My aunt stopped by last weekend to drop off this gorgeous wreath that she made for our front door. The fall wreath that we bought at Michaels a few years ago — maybe even going back to the time that I worked there in high school — needed a refresh, so she promised my mom that she would make us a new one. 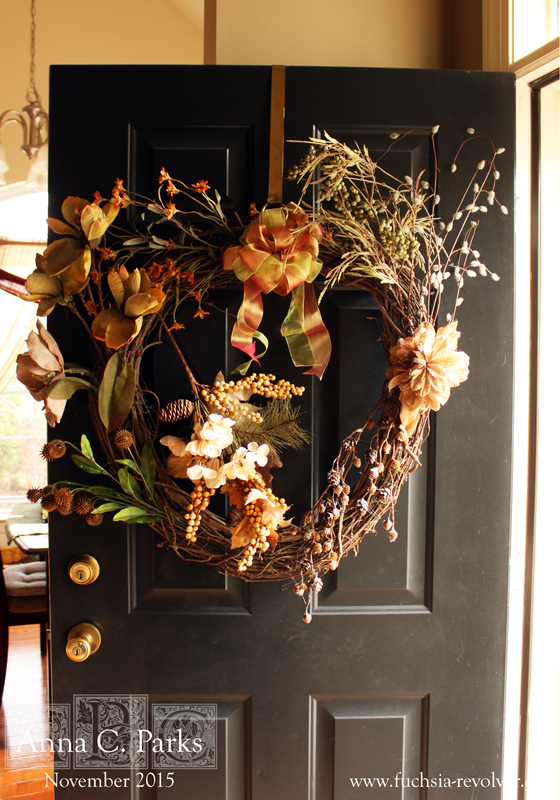 I love the muted fall colors in this, which I think are subdued enough for the wreath to hang from late-summer though fall and even into the early-winter months. 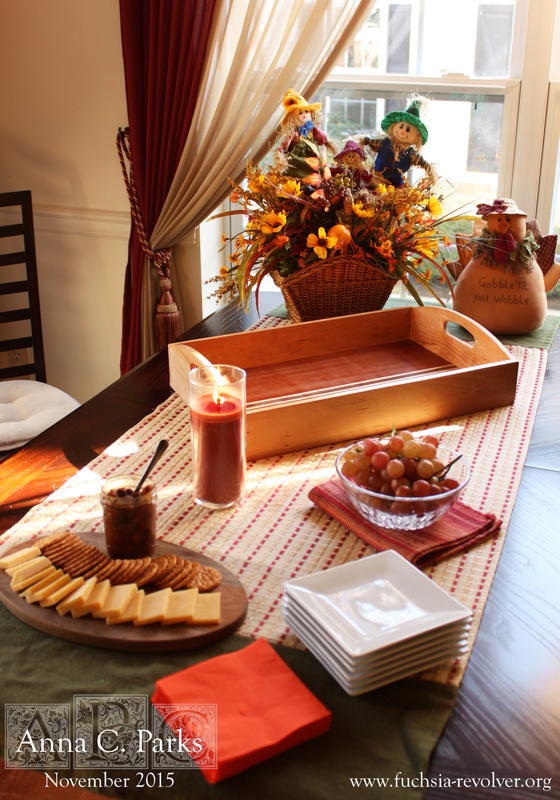 Not be outdone on the creativity scale, and certainly to also show our appreciation and not to leave anyone hungry because snacks are obligatory to have when a guest stops over, here is a picture of the quick table that I put together. I made the table runner for my mom earlier this year. This was one of my first larger sewing projects, albeit just a hemmed rectangle of three cut pieces of fabric pieced together. Steve made the cutting board and the gorgeous tray, both of which I use a lot for entertaining. Oh, and the colors may have also inspired me to grab a few similar tones to freshen up the ol’ Fourteenpress theme since, yanno, we established a few years ago that color scheme changes are about the extent of my hand coding new layouts anymore. Blame the timesucks that are work, life, and those sort of things… maybe I’ll get back to doing it someday (yes, I keep saying that…) Either way, yay, creativity! Nobody had lunch that day, so I put out mini lobster cakes that I picked up at Sams Club (like crab cakes, but better), sun dried tomato and cheese strudels, apple-pear chutney with crackers and Dubliner Irish cheddar cheese (triple yum and an excellent use of one of my fall canning projects. Recipe was likely from Food in Jars; if not, I tagged a similar one that I’m sure is also excellent. ), and red seedless grapes. Finishing off with something sweet to go with coffee, I made a glazed almond pound cake that featured one of my favorite ingredients — almond paste — and tasted fantastic. The strudels were super quick and easy to make, but sadly they didn’t make it for the photo opp. I made something very similar for the Oscars party this year, and both times they came out great. See the recipe below, which I hope is an acceptable substitute in lieu of a photo (but, I promise, I’ll get one the next time I make these ;), and let me know what you think if you make them. Heat olive oil a large skillet. Add onion and garlic, and cook until caramelized, stirring occasionally. If mixture sticks to the bottom of the pan, deglaze with a little water, broth, or white wine; scrape the pan; and continue cooking until mixture reaches a nice golden brown color. Add diced sun dried tomatoes, Alouette cheese, and mascarpone or cream cheese. Stir until combined and the cheese melts. Add mozzarella and Parmesan; stir. Season with salt and pepper, as desired. Set mixture aside and prepare the fillo sheets. Take one sheet of fillo, spread with melted butter, and add a sheet directly on top. Smooth down with your hand so the sheets are sure to stick together. Repeat layering the fillo and butter until you have four layers. Take approximately 1/4 cup of the cheese mixture and place at the end of the fillo sheet, spreading out in a rectangle shape and leaving 1/4 inch of space from the edges. 1/3 of the fillo should be covered with the mixture and the other 2/3 should be uncovered; we’re going to fold the sheet over twice to make a rectangle shape pastry. Brush the edges with the egg. Fold the entire thing over once, pressing the sides down so they adhere together. Brush the edges again with egg, and fold over again. You should have a rectangle shape pastry. Press down the edges so they stick, and make three shallow cuts in the center of the pastry with a knife. Carefully lift with a thin, wide spatula and place on a baking tray lined with a Sil Pat or parchment paper. Repeat until mixture or fillo are used up; you should end up with 3-4 strudels. Bake strudels at 400* F until golden brown and crisp. Can be served cut into smaller pieces as an appetizer, or with a mixed green salad for a light lunch.